It's a start, not just a start-up. Some people say, "Just get the ball rolling and then course-correct when it's moving." But I'm one of those people who tend to mess with stuff until it's just right. So, in the spirit of new beginnings, I'm going to send this sucker flying off the mountain. My OCD can kiss it. I'm not sure how to begin this blog. But maybe I should start by explaining the Go Solar video (currently the only video in the Animation section). 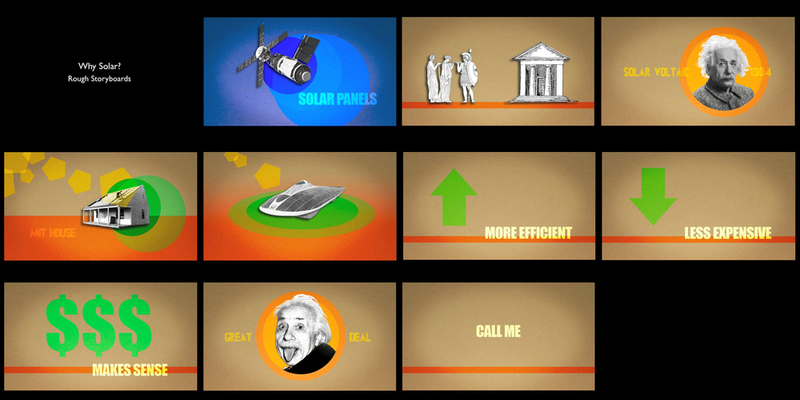 I created this motion graphics ad for a friend of mine who wanted a promo for his venture into the solar industry. He did the voice-over, provided what he wanted to talk about, and we worked up the final script together. Everything was made on my old MacBook Pro with After Effects, Photoshop and Soundtrack Pro. We recorded a few takes of his voice-over with a Blue Snowball USB microphone and used his Prius as a make-shift sound booth. This went from concept to storyboards to final video in less than a week. And it was a blast to work on! Comments? Critiques? I'm all ears.